On Tuesday evening, as we waited for Ehud Olmert at the guestroom of the prime minister's residence, he was talking on the phone with Silvio Berlusconi, who had just been elected Italy's prime minister once again. Berlusconi proclaimed his love for Israel and promised it would be the first country he would visit, as a guest at the State's 60th anniversary celebrations. 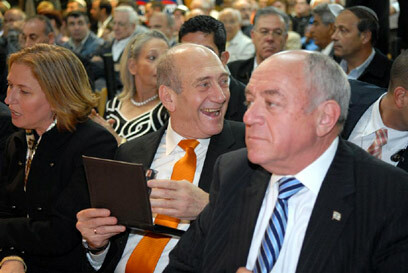 The conversation made Olmert very happy. Not just because of the Italian's enthusiastic support for the State of Israel, but also due to the brotherhood of the survivors. Berlusconi went through the seven halls of hell in his investigations, but somehow managed to overcome all of them and eventually win the elections. Two framed photographs with US President George W. Bush hang in Olmert's workroom. Bush is the only public figure hanging there. In one photo the two are pictured walking together, hugging. In the other they are checking which one of them is taller, neck to neck. Bush wrote on the photo, "Dude, it's good to see you again." 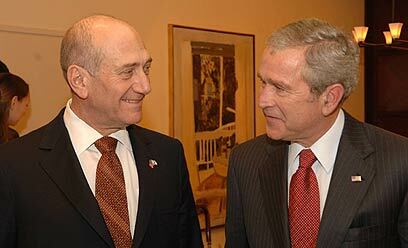 It appears there is a note of defiance in the exhibited friendship between Bush and Olmert. Who are you to not count us in your public opinion polls? Look at where you are and where we are. We came to Olmert with difficult, bothersome questions, some of which were left unanswered. Olmert seeks to convey the message that all the cards are in his hands, but they are closely attached to his chest. This is true in regards to Iran, Syria, Gaza, Palestinian President Mahmoud Abbas and even Defense Minister Ehud Barak. 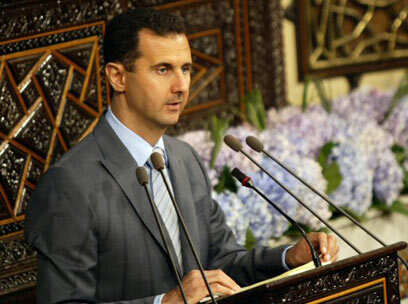 His main message is Syria: He is extending his hand in peace. He knows what Syrian President Bashar Assad expects to receive. Assad knows what he expects to receive. And now all that is left is to draw a bridge between the expectations. Before we launch the celebrations of peace, we should remember that there is a significant level of tension between Syria and Israel after a northern Syria facility was bombed last September and following the assassination of Hizbullah commander Imad Mugniyah. Assad must be calmed down. In addition, the Israeli public must be given hope. Syria is the message. How are you feeling? Several months ago, you announced that you had been diagnosed with prostate gland cancer and that you were about to undergo surgery. Months have passed, with no operation and no report. Can you tell us about your medical condition, to what extent does it affect your division of attention, are you undergoing treatments? "My medical condition is normal. I keep a busy, intensive and long schedule – sometimes perhaps too long. I continue to engage in sports. I am under constant medical supervision. It is clear that I will have to undergo a medical procedure. The final decision on the type of procedure will be made soon." If you undergo surgery, will you do in Israel? "I have no plans to undergo surgery abroad." The prime ministers' club, which includes (Opposition Chairman Benjamin) Netanyahu , Barak and yourself, is considered by the public an exclusive club of hedonists, we said. How similar are they to you? How different? "I will not talk about Barak and Netanyahu, for two reasons: First, I have respect and appreciation for them. They are both worthy people. Second, I don’t know about these things from personal knowledge, but from what I read in the papers. "Regarding myself, I think these descriptions are highly exaggerated. But I decided long ago that have no intention of fighting this. No matter what I say, at the end someone will print a picture of me smoking a cigar. I live a modest life. Branding me a 'hedonist' is unwarranted." Are you willing to declare, like Rabin, Peres, Netanyahu and Barak, that Israel would cede the Golan Heights for peace? "I don't know what Netanyahu, Barak and Rabin said… what I can say is that I am very interested in a peace process with Syria, I've been acting on this issue and I hope that my efforts mature into something meaningful. "I can assure you that on matters concerning Israel and the Syrians, they are well aware of what I want from them, and I know very well what they want from us." Olmert refused to elaborate further on the nature of talks between Israel and Syria. He also refused to say whether he has been following in his predecessors' footsteps. What does that mean? Don’t you know what your predecessors promised the Syrians throughout the years? Aren't these things recorded? "I didn't say that," he stressed. You said you don’t know what Netanyahu, Baralk and Rabin promised. "That's true. I don’t know if was recorded is exactly what was said. I have heard many things from many people. I will only say one thing, and I am serious and mean what I say: There is room for a process which will lead to an agreement between Israel and Syria. The Syrians know I want this. They know what my expectations are, and I think I know what their expectations are." "I don’t wish to respond to that." 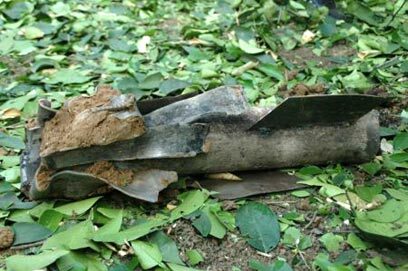 Last week, during the large-scale home front drill, the government spokespeople reiterated that all of Israel was under the threat of Syrian missiles. Perhaps instead of training all of us to run to the bomb shelters, you should finalize a deal with the Syrians which would remove the threat. "As part of the lessons drawn from the Second Lebanon War and the need to take the Winograd report seriously, the Defense Ministry chose to carry out a drill. Carrying out such drills does not prevent us from looking into any option of obtaining peace." On Tuesday, the US Congress' intelligence committees are planning to discuss the leakage of nuclear technology from North Korea to Syria. On the backdrop of this discussion stands the Israeli strike on September 6. The Americans know what happened there and what is happening today. Only the Israelis, the ones being threatened, don’t know. "There are thing I won't address. I will only say this: As far as I know, Israel's citizens are not threatened by Syrian nukes." Gilad Shalit has been held by Hamas for nearly two years. The price for his release is known. The decision is on your hands. What are you waiting for? "I sympathize with the pain regarding the captives and the MIAs. There's no one who wants to see them return more than I do. I am not stalling. I am involved and act on this issue almost on a daily basis. I'm doing whatever I believe can be done. The defense minister fully supports these efforts." Can you tell the Israeli public whether you have red lines - whether there are terrorists you would refuse to release in exchange for captives? "There are things that no responsible prime minister would do. I can't tell you what those things are. All I can say right now is that the price is not the obstacle for Gilad Shalit's release." Do you think Jimmy Carter's intervention is a positive thing? "No. I think he's come here at a bad time and with an irrelevant agenda. I'm friends with him. I don't boycott him… I admit: I don't want to lend a hand to a legitimization of Hamas. By meeting me two days before meeting Khaled Mashaal he would have created the false impression that there are negotiations between us and Hamas." Were you presented with an assessment by Israel's intelligence organizations that captives Ehud Goldwasser and Eldad Regev are no longer alive? "No such assessment has been presented to me. It would be irresponsible… for the prime minister to make such a statement based on estimates. If an authorized, professional body makes an assessment on which their current fate can be determined, I will certainly come out with a statement." It seems that outside the Prime Minister's Office no one is taking the negotiations with Abbas seriously. Isn't the Israeli public entitled to know what's going on? "Serious negotiations should be carried out away from the spotlights. The curiosity is understandable and I respect it." We're not talking about curiosity, we're talking about concerns. "Perhaps some peoples' concerns and others' hopes. I understand this, but I have to act responsibly. This is a matter of huge importance to the State of Israel. One cannot hold profound, straightforward and open talks with the head of the Palestinian Authority and then report them to the media. "These negotiations are being carried out seriously. All the topics are on the agenda, but there is some hierarchy in the order they are being discussed. Jerusalem, for instance, is last on the agenda. This is the most sensitive and most difficult issue. It would have been foolish to begin the negotiations with the issue that would most likely lead to disagreement. "It was clear from day one to Abbas, Rice and Bush that construction would continue in population concentrations – the areas mentioned in Bush's 2004 letter… I say this again today: Beitar Illit will be built, Gush Etzion will be built; there will be construction in Pisgat Ze'ev and in the Jewish neighborhoods in Jerusalem. It’s clear that these areas will remain under Israeli control in any future settlement." What significance is there to talks with a man who doesn't control anything? "If we don't negotiate with Abbas, whom you say is weak, who should we negotiate with? If we don't negotiate, and the terror groups take over Judea and Samaria, will those who oppose talks with Abbas support negotiations with Hamas? Would that be easier? More productive? Contribute more to security?" Abbas doesn't seem to be in any position to implement any agreement, which is why we said – the Road Map first, implementation second. "The fact that there were no negotiations did little to stop terror. Maybe on the contrary – it increased it. I want to talk. I won't miss any opportunity to try and reach an agreement. "If we cannot reach a two-state solution, we'll end up with one state for two nations. That's what I said back in 2003. If we end up with only one state between the Mediterranean see and Jordan, with all its citizens given a choice, the Jews will become the minority. 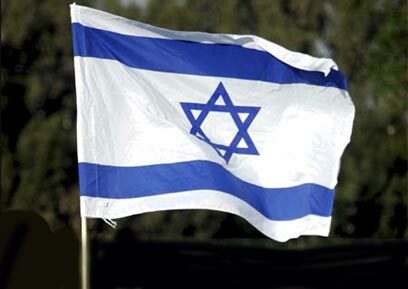 It would be the loss of the Jewish state, which we believe to be the basis for out existence. "The international view is different, and not necessarily because of anti-Semitism. Some people in the US, in Europe still don't think a Jewish state is a natural thing, because their states are consisted of a mixture of peoples and religions." Netanyahu blames you for enabling an Iranian base to form within Jerusalem. He sees it as a threat to Israel's mere existence. "Netanyahu has been using the fear factor his whole life. That's how he got elected prime minister in 1996 and that's how he'll try to get elected again. He said that Peres would be the one to divide Jerusalem; later he said Barak would be the one to divide it, and now he says that of me. I say to him 'take off your sandals,' ('for the place where you are standing is holy ground,' Exodus 3:5). You will not be able to match what I have built in Jerusalem. I'm the one who built the neighborhood in Har Homa. I'm the one who got criticized for it." You've also built Ras al-Amud, in the middle of an Arab neighborhood. "Everyone knows that the opinions I hold now are not exactly like the ones I've held in the past, but the decision about Har Homa is not one I regretted then, nor do I regret it now." Both you and Barak ordered the construction projects in the West Bank be halted. How does that coincide with the latest news about it being resumed? "Under the current, sensitive, circumstances, I thought the person making such decision should be the one most accountable. The only way to monitor the process properly was to issue an order to freeze construction and review the whole situation. I will be the one making the decision. 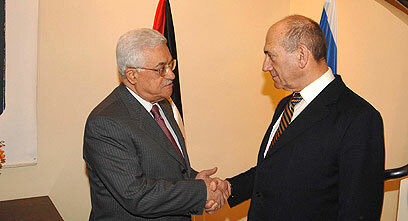 Me, and the defense minister, who is innately in-charge of the West Bank." And are the two of you really supervising matters? "As far as any (construction) compromises go, absolutely. I assume some things do fall through the cracks here and there." We promised the Americans to vacate 26 illegal outposts. Instead, just before Bush arrived, the IDF clears a minute, insignificant one. "I can't say we lived up to our obligations, but as things stand, both sides have failed to live up to their obligations. So what? That's a reason not to hold negotiations? That's a reason to halt the entire peace process? We've already experienced this situation." This isn't just about the Palestinians. The question is whether or not this government can enforce the law. "The question is where do you put your energy. Some things are on higher priority than others." But aren't you caving in to political pressure, we insisted, Shas' for example? When it comes to the Gaza vicinity area, your government is in breach of its most basic obligation – to provide the citizens of the state with security. "There's no arguing with the ongoing threat to the safety of those living in the south, and we have yet to find a definitive answer for the situation. Our solution to terror threats in other parts of Israel was not found in a day, nor did we come up with it within a year. I believe that eventually the reality created there would be entirely different than the one we are familiar with. Suggesting we should consider mimicking Hamas tactics may be appropriate for a newspaper article – not for the government. " Can you promise that by next Passover Qassam rockets will be a thing of the past? "I certainly hope the south knows peace. We will make a monumental effort to make sure of that, as we are doing today. I want to remind you that 200 Hamas operatives were killed in Gaza in the past two months. We are working day and night." Your negotiations with Abbas are under the premise that the Gaza Strip will be a part of any future agreement; but you know that the assumption is that Gaza is lost to the PA – they have no hope to regain control there. "I'm well aware of that assessment, but there is a historical significance to reaching a border-based agreement with Palestinian officials. If we reach such an agreement it can propel greater moves, with results we can't assess at this time." The Palestinians say Barak is making life difficult in the West Bank. "I would like to see us become a little more flexible." Some of your ministers want to see Marwan Barghouti released. You've called that an interesting notion. But you did, we insisted. Are you inclined to support his future release? (National Infrastructure Minister) Binyamin Ben-Eliezer, a member of your cabinet, recently threatened that Israel will annihilate Iran. Was he speaking for you as well? "He would have been better off not saying that. We have to take the Iranian threat very seriously, and we do; but I don’t' believe Iran will attain nukes. As for all we're doing in the matter – the less said the better." Peres visited the Treblinka concentration camp this week, and reiterated the ever-familiar cliché that if the IDF have existed during WW2, the Holocaust would never have happened; and here you are, warning us of the nuclear holocaust Iran has in-stored for us and praying someone else – the US, Europe – will put a stop to it. "I don’t' think anyone saying that the IDF could have prevented the Holocaust means it would have had to fight the Nazis all on its own. The same goes for Iran. Iran doesn't just threaten Israel, that is why our first goal is to mobilize the international community to take part in this fight; and that avenue has been successful." (Former Chief Justice) Aharon Barak said he met with you several times and warned of the apparent war Justice Minister Daniel Friedmann is waging on the High Court, but you – he said – did nothing. Do you share his premise, that Friedman is destroying the democracy in Israel? "I'm afraid that debate has been blown out of proportion. There is no threat to the High Court. I would never allow its independence to be compromised. It is a fortress of democracy and I respect it and its chief justice. "We have an outstanding justice minister. I never would have though to name him so if I believed, for one minute, he wanted to hinder the court's independence. Prof. Friedmann was recommended to be by Prof. Amnon Rubinstein, up until then I had only met him once. Anyone who tries to turn Friedmann – who is a renowned jurisprudent and an Israel Prize winner – into an enemy of democracy is exaggerating. "I thought I could settle the argument. I offered Barak to head a committee that would draft a law assuring the independence of the court and Friedman agreed to that. Barak agreed at first, but then backed out, and I'm very sorry he did. I hope he reconsiders. I hold him in the highest regard, and we're close friends, but I don’t agree with everything he says." 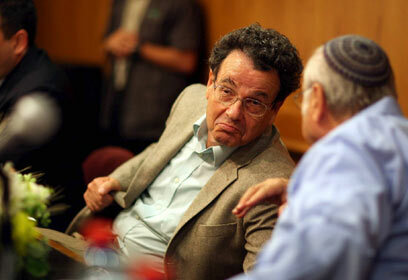 How do you explain the both Benjamin Netanyahu and Ehud Barak sided with Aharon Barak? "I'd rather not comment on other people's saying and consistencies." Does this threaten your coalition's stability, we pushed. "Nothing is threatening my coalition's stability." The latest polls show your popularity at its bottom. Are you still determined to head Kadima in the next general elections? Do you thing a union of Kadima and Labor is due? "I will head Kadima in the next elections and we will win them. That should be clear. Anyone who knows me knows I don’t shy away from confrontations. I don't want to get into any popularity contests right now. All the polls have me in a better position now then I was six months ago. I believe that when the public votes it will back me up. "As for uniting Kadima and Labor – Kadima was created in part by those who left Labor and those who left the Likud, so the idea itself in not strange. It could happen in the next few years, but I'm not dealing with it now, I'm dealing with matters of the State." Still, some Labor ministers seem closer to you than to their own party. "I'm on good terms with all my ministers, including Shas ministers and those from the Pensioners Party." Is that true where Ehud Barak is concerned? "Of course. Absolutely. We don't always agree on everything, but we respect each other. Well, at least I respect him – I can't speak for him. I head a team that runs the affairs of the State. I couldn't ask for a better team. "Don’t be tempted by polls. If anyone can come up with an alternative to my policies go ahead and present it. Who's the alternative? The one promising us never-ending war? What do you want us to do in Gaza? Get up tomorrow morning and gun down every Palestinian civilian? "I will head Kadima, I will fight anyone running against us and we will win, because the people have a sense of justice and balance." The overall feeling is that the economy is heading for recession. Who are you gearing up for hard times? Won’t the social benefits you're so proud of be cut back? "The Finance Ministry's analysts, the National Economic Council and the Bank of Israel all believe we'll see a slightly slower market growth this year, but Israel is not heading for a recession. The numbers of the first quarter of 2008 show growth. "I have no intention of cutting back on social benefits. Any decrease in the growth rate affects the lower echelons first. I'm not going to make things worse for them." Finance Minister Ronnie Bar-On slammed the Prime Minister's Office plan to have a joint council of the government, the Histadrut Labor Federation and the employers, take over for the Treasury in determining financial policies. "It wasn't the Prime Minister's Office plan; it was (Histadtur Chairman) Ofer Eini's and (Manufacturers Association of Israel President) Shraga Brosh. The finance minister is going against them, not against us. I'm not familiar with the particulars of the plan, but I doubt they want to stage a coup." There's a battle between the finance minister and Raanan Dinur – your director-general. "It's a classic argument. The Treasury is a powerful system. It's only natural it wants to define the priorities of the state. There's a real fear of loosing control there. I'm not dismissing anyone there, they're wonderful people, but I –as prime minister – have a broader view of things, and I have to follow it. I gave my word that we will not exceed out expenditure limit – and we won't; and we will no deepen the deficit – we will decrease it." Do you plan to cooperate with the state comptroller in the investigation into the Pollard affair ? "I have instructed all the people involved in the issue to cooperate with the comptroller." Will you answer questions presented by the comptroller's people? Olmert's answer is negative. "My conversations with the US president are no one's business." The relations between the comptroller and yourself seem to be a lost case. "Nothing is lost. Every time I was asked to appear before the Knesset's State Control Committee, I did so." Do you believe the comptroller is out to get you? "I have no time to devote to such issues. I don’t know what the comptroller is driven by. I have to run the State's affairs. That's more important." The national spirit is somewhat low. Is this the right time to hold a festival of celebrations ahead of Israel's 60th year of independence? "There is no festival of celebrations. Most of the events' budget is dedicates to education, society and periphery. The part dedicated to parties and fireworks is smaller than in previous years." Do you still believe it is fun living in this country? "I believe that it is now safer to live here. The citizens don’t always know thanks to what, but I know. There are fewer poor people in Israel today, slightly fewer, more money is invested in education, the unemployment rate has dropped. For those who work, it is more fun to live in this country." So what causes all the recent violent acts on the roads, in schools, in nightclubs, inside families? "It won't help if I say that this year there were less road accidents than in previous years, fewer people were killed in accidents, there were less terror attacks and fewer people were killed in violent crimes. "You are talking about an atmosphere. I agree that there is an atmosphere. This is a country constantly shaken by internal difficulties and external threats. There is no artificial way to solve this issue. We must improve the quality of life and strengthen the forces assigned with enforcing the law, while paving the road for peace with our enemies." Do you think people are treating you fairly? "It's difficult to say. There are those who are and those who aren't. I feel I am treated today with a higher sense of relaxation, agreement and acceptance. I won't hide one thing from you: There have been some very painful moments. I've been through this mill of endless evil. A lot of wickedness, lack of support, pettiness. "Facing these things you thinks to yourself, if you would see this happening to someone else you would go crazy, but it's not happening to someone else: It's happening to you. You see how painful it is for the people close to you, who love you. There is work being done in this house. There are no parties." See all talkbacks "Olmert: Israel not under Syrian nuclear threat"